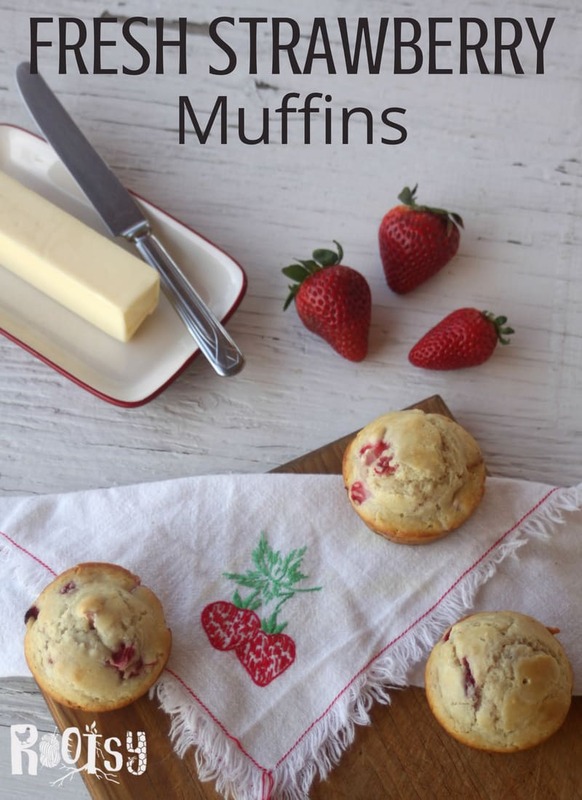 Make the most of juicy berries by whipping up these quick and easy fresh strawberry muffins for breakfast and snack time. Strawberry season is a glorious time of year. They’re great dipped in chocolate or served on shortcake. Fresh strawberry muffins are a great way to enjoy them for breakfast too. These muffins come together quickly. 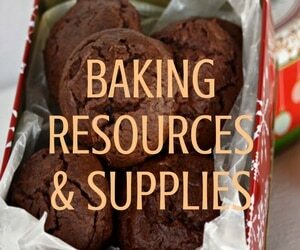 They can easily be made in the morning before breakfast or after a long day for a grab and go meal the next day. There’s no need to soften butter or pull out a heavy mixer. 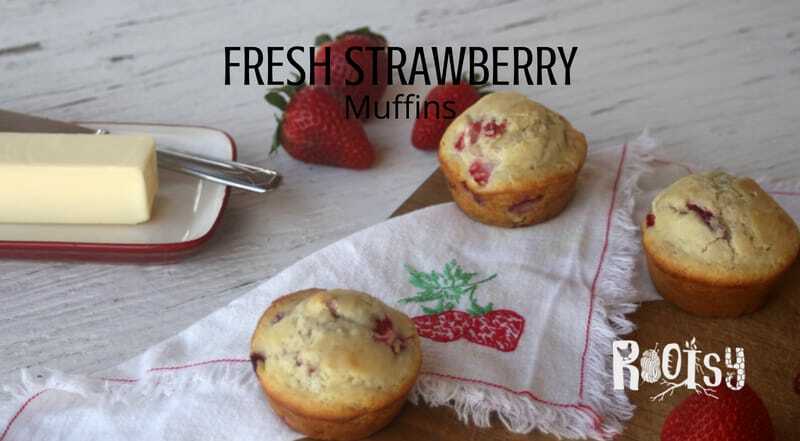 Enjoy fresh strawberry muffins in few days after they’re made for delicious meals or snacks. Alternatively, make double or even triple batches and freeze for later. 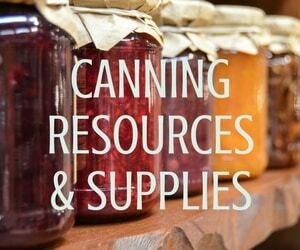 Simply pack them in containers or bags and freeze until needed. Strawberries are particularly delightful in these tender muffins but any berry would do. Smaller berries like blueberries can be used whole. Raspberries, blackberries, serviceberries, and more would be tasty and easy. Use fresh strawberries for an easy and quick breakfast. Whisk together the flour, baking soda, and baking powder. Set aside. Whisk together the melted butter, sugar, milk, and egg until emulsified. Pour the wet ingredients into the dry and stir until almost completely incorporated. Add the strawberries and fold into the batter until uniform. Fill the muffin cups until almost full. Bake 15 to 20 minutes or until an inserted toothpick comes out clean. Cool in pan for 5 minutes before turning out to cool completely on wire racks. 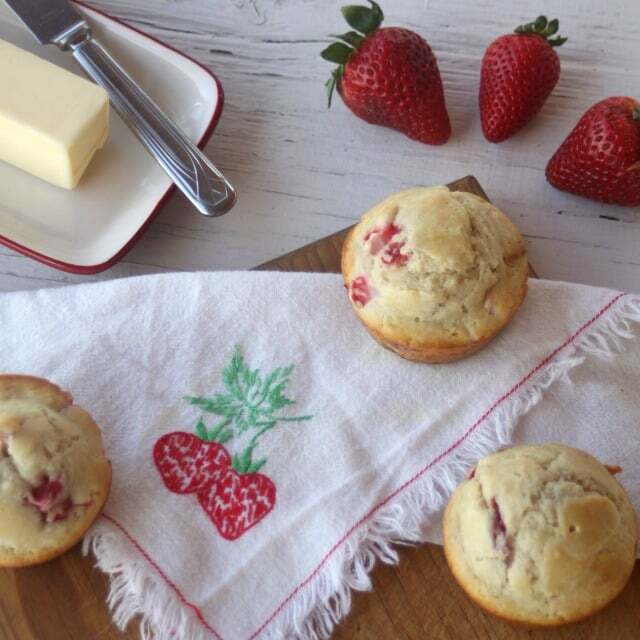 What’re your favorite ways to dress up fresh strawberry muffins? I made these following your recipe for my husband and they were a hit. I then switched out the flour for GF flour for my grandson and they were just as easy to make and still liked by everyone. Great way to use our fresh strawberries.